The Pediatric Research Center (PRC) combines research, top-notch care and compassion to offer exceptional care for children. Whether your child is coming in for an outpatient research appointment or staying overnight for an inpatient research visit, he will be in the hands of highly skilled medical professionals with specialized training and expertise. Our team is well equipped to meet the unique needs of your child, and we take pride in delivering safe, compassionate, quality care. 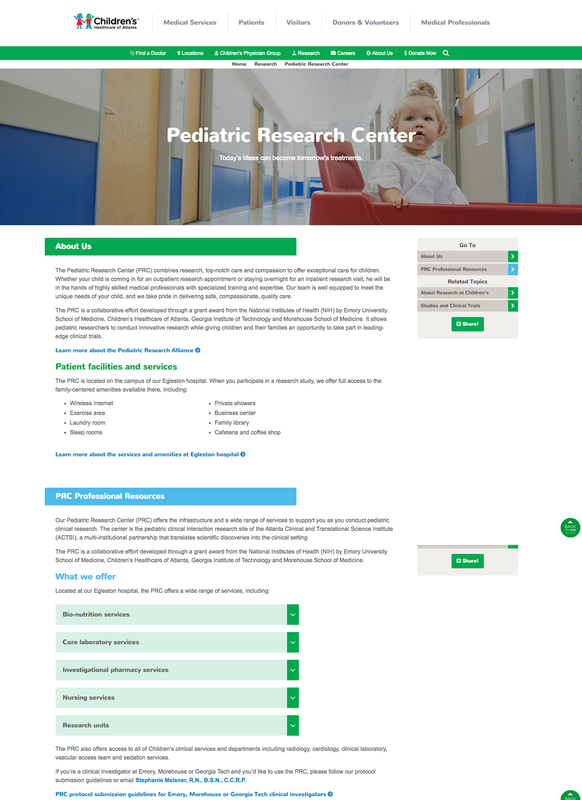 The PRC is a collaborative effort developed through a grant award from the National Institutes of Health (NIH) by Emory University School of Medicine, Children’s Healthcare of Atlanta, Georgia Institute of Technology and Morehouse School of Medicine. It allows pediatric researchers to conduct innovative research while giving children and their families an opportunity to take part in leading-edge clinical trials.